Description: Weighing 100 to 250 kg (220.5 to 551.2 lbs), red deer were named for their coat colour, a deep red brown with lighter underbelly and a distinct cream coloured rump. 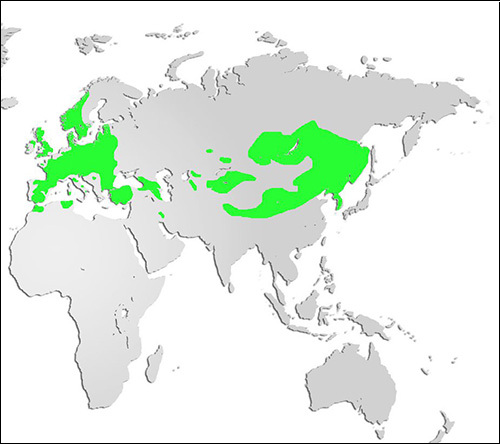 Distribution and Habitat: Native to Europe, Asia and parts of Africa, red deer tend to remain in one particular territory rather than roam indiscriminately. They prefer open woodland habitats but can be found in coniferous swamps and clear cut areas. In the United Kingdom Red deer are classified as a Species of Conservation Concern under the UK Biodiversity Action Plan. Diet: Herbivores, red deer are ruminants, grazing in the morning and late afternoon, eating a diet of varied grasses and foliage and spending the hours in between re-chewing what they have already eaten. Life Cycle: Like other deer species, red deer breed in the fall, during a period called “rut”. Males (stags, or harts if they are over 5 years of age) bellow noisily, aggressively challenging other males for dominance over the females (hinds). Spotted young (fawns) are born in the spring, following a gestation period of 240-260 days. Fawns will stay with their mother for nearly a year; females will typically remain with the maternal group, but young males go off on their own. Adaptations: Red deer stags grow antlers annually, shedding them mid-winter. Increasing in size each year, antlers are used for self-defense and also as a symbol of male prowess when stags are competing for harems. Did you know? 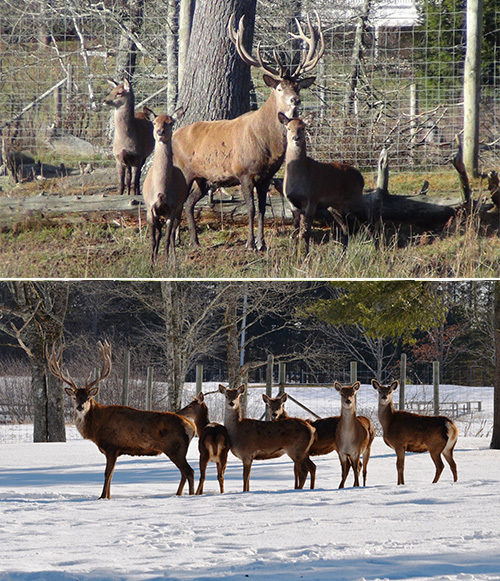 The red deer in the Park were a gift to Nova Scotia from the Queen Mother of England in the 1970s. The red deer found in Canada are a different species, larger and male vocalization is a whistling bugle rather than the roar of European red deer.